In this series we will look at all the different sewing tools and accessories and general stuff you can use to make your sewing run smoothly. Back in the day the first step to learning to sew was to get out the needle and thread. We learned the basic stitches – backstitch, catch stitch etc all useful to know for a bit of mending on the go. However, to make anything larger than a hanky – the best tool for the job is the trusty old sewing machine. 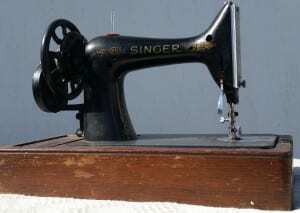 Back in the 1800’s Isaac Singer founded his company and went on to become the biggest manufacturer of sewing machines. The Singer sewing machines went on sale in the 1850’s to the general public – however only the very wealthy could afford them initially but they were more widely used and available as the 20th Century went on. Here is a link to a great article for anyone who wants to get a more detailed account of sewing machine history. Free – check your parents or grandparents attic to see if there’s an old machine lurking up there. You are bound to know someone who has a machine lying idle who wouldn’t mind you borrowing it for a while. Basic and cheap as chips: Aldi and Lidl – in recent years both of these discount supermarkets often have sewing machines and occasionally overlockers/sergers (we will get to them later on) on sale for €100 – €150. Sometimes they are a generic brand or I’ve noticed Aldi and Lidl have had a Singer for €100. From what I’ve heard through the grapevine these machines are perfect for simple stitching and would be great to practise on and make plenty of different items – cushions, tote bags, simple clothing (not sure how well they’d chew through a few layers of denim). If you hurry you may find a few left in your local Lidl – they had both machines and overlockers in on Monday 12th October!! Amazon have machines in this price range too – Link. Second hand: Look on Done deal, Buy & Sell, Advert.ie (Ireland), eBay etc and you’ll find plenty of sewing machines for sale. If you are looking for something a bit fancier or more advanced you will find something suitable eventually. There are often industrial machines on sale – perfect if you want to make curtains etc. Only drawback is there is no guarantee or servicing involved with buying these machines and if you are going for an expensive one – bring someone who knows a bit about machines to try it out before you commit. Otherwise your local sewing machine shop i.e. Singer shops often have trade in machines which have been serviced and are ready to go for around the €100 mark. You might find a gem among these! Middle of the road: There are lots of machine around if you are willing to spend €300-€500. The machine you want will depend on what you want to use it for. Do your research, look up reviews – there are lots of reviews online if you do a Google search. Just have a look here to see the huge range of machines available. There is a wide variety of makes and models and most popular at the moment are Singer, Brother, Janome…. Bernina are considered a bit elite and those who use them swear by them – I’ve never had the privilege of trying one so can’t give you my opinion. Juki are also another brand who specialise in industrial machines but they have a range of domestic machines and are reputed to be quite robust. Although I don’t know how easy it is to find them in Ireland. The other brands mentioned above all have more expensive models but if you are in the market for one these machines – you know what you are at! What is an over locker you may ask? An overlock is a kind of stitch that sews over the edge of one or two pieces of cloth for edging, hemming, or seaming. Usually an overlock sewing machine will cut the edges of the cloth as they are fed through (such machines being called “sergers” in North America), though some are made without cutters. It is useful when sewing jersey and stretchy fabrics – if you are making a t-shirt or pair of leggings. The stitches have a bit more stretch than a regular sewing machine stitch. It’s also useful for finishing seams in any garment. 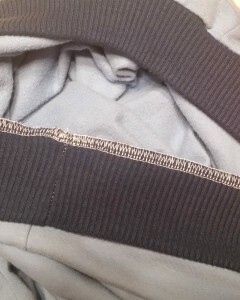 If you look inside your shop bought clothes you will notice that they are mostly finished this way. It’s a useful tool but you can do most things with a regular sewing machine – even sew stretchy fabrics – all you need to do are to use a zigzag stitch and a suitable needle usually a ball point needle (I will go into this in more detail in a future post). There you have it – Sewing machines, if you have one – what is it? What’s your dream machine?? In another post we will look at accessories to get the most from your machine.